Timothy George, founding dean of Samford University’s Beeson Divinity School, announced May 16 that after 30 years he will step down as dean at the end of the 2018-19 academic year. At that time, he will transition to a new role within the divinity school faculty as a research professor. 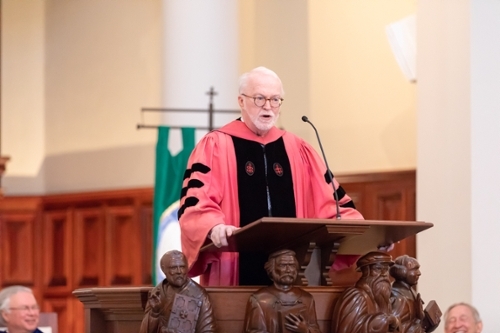 George came to Birmingham in 1988 to start a divinity school on the campus of Samford University at the behest of Ralph Waldo Beeson, the divinity school’s benefactor, and then-Samford president Thomas E. Corts. Under George’s leadership, Beeson was established as the first divinity school at a Baptist college or university in the United States. During George’s tenure he has overseen the design and building of Andrew Gerow Hodges Chapel, which was dedicated in 1995; established a world-class faculty known for its excellence in publishing, teaching and church-community influence; and most recently presided over the installation of Robert Smith Jr. as the first Charles T. Carter Baptist Chair of Divinity, one of eight endowed chairs. But, George said he is most proud of the nearly 1,300 Beeson alumni serving in ministry in every inhabited continent of the earth. “I think back over these past 30 years eucharistically,” George said. “Eucharist is one word for the holy meal Jesus gave to his disciples, but it also means thanksgiving. Grace and gratitude are closely related. God’s blessing on Beeson Divinity School for the past three decades calls us to reflect on both. Michael Hardin, Samford provost and vice president for academic affairs, said he’s grateful George will remain at Samford during his next phase of ministry. Hardin added that details of the search for George’s successor will be announced in the fall.